I'm Kimberly from A Night Owl. For my paper mantel, I decided to go with a 4th of July theme so that it can get us into the spirit of the holiday, and also allow me to keep it up for at least a month! Hehe! More bang for your buck, right? The first thing I decided to make was a large paper flag. I simply used strips of colored cardstock and white cardstock stars modge podged onto a piece of cardboard. Next I decided to come up with a fun 4th of July subway printable (that you can come snag for FREE from my site), and simply glued that to a fun striped piece of paper. Lastly, what better to make with paper that has a fun and festive Summer feel than pinwheels? I have seen so many in stores and on party displays lately that I just knew that it would give the mantel a fun and effortless feel. I hope you enjoy how it all came together. I do! Really simple, but I loved the challenge that just using paper provided and love the light airy feeling that it gives our entryway. Bring on the holidays! And a huge thank you to Emily for this opportunity to join in all the festive fun. Thanks so much for sharing, Kimberly! 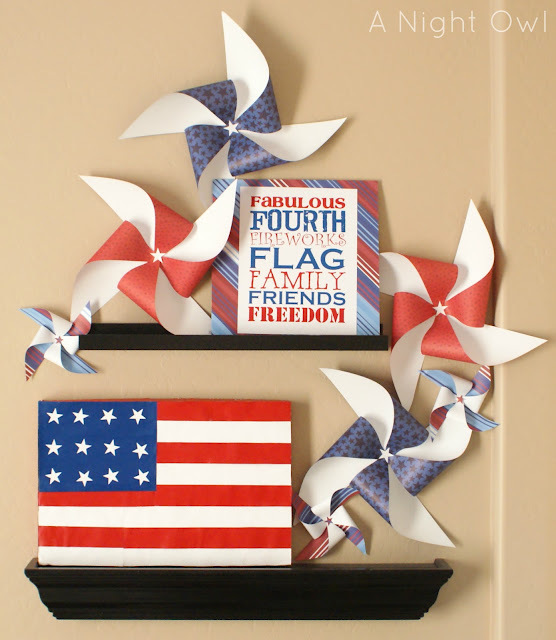 I love that you went with a patriotic theme for your mantel! The red, white and blue is classic and summery and you're all set for July 4th! And, I will definitely be heading over to grab your free printable! To see Kimberly's full mantel details, head over to A Night Owl! Very cool! Love the pinwheels.